Best conventional reel buyers guide: Cast away! Home Outdoors Best conventional reel buyers guide: Cast away! Image courtesy Bill Brine via Flickr. Used under a CC BY 2.0 license. The best conventional reel is designed for casting and reeling in big fish. While a spinning reel may have greater ease for beginners, conventional fishing reels give you more control after you have hooked the fish. Let’s survey what you need to know when getting a good conventional reel for the money — whether under $100, $200, or $500. It is important to note that many conventional reel brands like Shimano, Daiwa, Fin-Nor, and Penn have reels that cost more than $500 so know your budget. Read conventional fishing reel reviews from 2019 on Amazon. A conventional reel will have an axis and be perpendicular from the rod. Meanwhile, spinning reels sit in a parallel station to the rod. The advantage of a conventional reel is how you can cast the line much farther and faster. Also, a conventional reel will communicate the vibrations of the line better, and that will mean that you miss less strikes in the water. Conventional reels often come in two flavors: round or low profile. Round feature a traditional design and are round in their cross-section. Low profile reels have less height than round and have a more oblong shape. In general, round reels work well with casting bait, are stronger, and have a greater line capacity. In general, low profile may work best with lures and may have a level-wind mechanism. 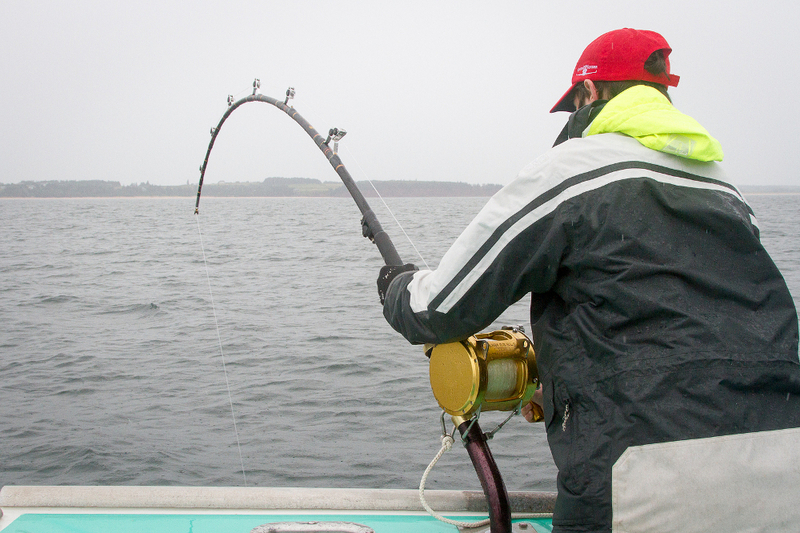 While reeling, a level-wind helps distribute the line across the reel. Many conventional surf reels designed for off-shore fishing don’t have this feature. A level-wind works well when there is a lot of casting and retrieving using small and medium lures. With live bait, there is little to no casting and retrieving and a level-wind may be unnecessary. Also, a level-wind diminishes casting distance and may break when a big fish like a tuna is hooked and runs. Reels need a form of brakes to prevent backlash, which can occur when the bait / lure hits the water and the reel does not stop spinning. As you can imagine, the line gets snarled at the reel and makes a mess. There are different types of brakes available: magnetic and centrifugal. Centrifugal tend to be more “set and forget,” but brake choices are subjective. Some reels come with dual brakes — both magnetic and centrifugal. Because some rods have been designed to work better with certain reels, you want to look at the rod closely and make sure it will work with a conventional fishing reel. A conventional reel on a rod intended for spinning reels will place greater demands on the reel that it has been paired with, and as a result, it will not last as long. Whenever looking at the rod, you also need to look at the flexibility, action and strength of the rod to get the most from your choice. You also want to choose gear that will fit with your style of fishing, so while a guide can put you in the right direction, you still have to look at what you’re fishing for. Both the rod and reel should be compatible in terms of strength and design. The golden rule of thumb with conventional reels is that they will have a smaller guide and collector than a spinning reel rod. The reasoning behind this is that the line from a conventional reel will come out straight and even. Spinning might be ideal for some species of fish, but their limitations include drag durability and capacity. With a conventional fishing reel, the biggest complaint among fisherman is how it requires both coordination and practice to regulate the spool. That problem may be combated with choosing a more modern reel because some newer conventional reels may include a drag system that allows you to adjust for the resistance and drag on the spool. With this in mind, you can calibrate for speed and maximize the distance for casting. As fishing gear continues to improve, reel manufacturers have continued to make their fishing products better, and they have designed reels for specific purposes with characteristics that are intended for improving performance with a specific technique. You should choose a reel based on the reason that you intend to use it — such as long distance surf casting. Find the best conventional reel on the market in 2019 on Amazon.